Because it generates overwhelming amounts of data, MDI is an issue HIM professionals need to address with hospital executives. HIM experts forewarned the healthcare industry of an approaching HIPAA 5010/ICD-10/meaningful use perfect storm. What has gone largely unnoticed in the accompanying wave of EHR implementations is the oncoming tsunami of life-critical patient data generated by medical devices. The U.S. medical device market, estimated to be $105.8 billion in 2011 by market research firm Espicom, is booming despite the overall economic downturn. The exponential growth is attributed in part to dramatic increases in the number of device types (eg, IV smart pumps, smart beds, bedside lab and vital sign monitors), patients being monitored across all venues of care, and devices deployed per patient in all care settings. Most acutely ill patients can have a dozen medical monitors and devices continuously collecting massive volumes of life-critical data, according to Ann Farrell, BSN, principal of Farrell Associates LLC, a strategic HIT consulting firm currently focused on point-of-care solutions. Farrell adds that it’s not unusual for critical care RNs to document more than 1,000 data points per shift, including recording vital sign readings at increasingly frequent intervals. Stillwater partnered with Accent on Integration, a systems integration firm focused on data sharing within the hospital and across the community, including the integration of medical device data with EHRs. Company Cofounder, President, and CEO Marc Andiel says having real-time, readily available data can make hospitals safer. “Having data in silos or relying on data that are manually entered makes hospitals more prone to errors,” he notes. Medical device integration (MDI) with clinical information systems (CIS), most notably EHRs, eliminates labor-intensive and error-prone transcription and the manual entry of monitor and device data into an EHR, Farrell says. With physiologic monitor data integration, RNs using critical thinking select data from continuous monitor readings that best represent a patient’s current status. Farrell says RNs filter medical device data prior to documenting in both paper-based and electronic processes. With MDI, device data are “imported” and validated by RNs prior to updating the EHR database. 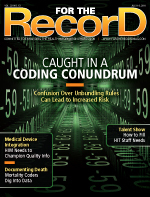 “Some EHRs allow unvalidated data to be reviewed and accepted in the EHR flowsheet, while others require validation on a secondary screen prior to updating the EHR,” says Farrell, adding that without an RN medical device data quality assurance step, artifact and data outliers prevalent in critical care settings would be captured. This could result in patient harm if physicians in decision support use inaccurate data or EHR and surveillance systems trigger inappropriate and potentially contraindicated alerts, warnings, or conditional orders. Most lower acuity, subacute, and ambulatory patients are not monitored continuously, Farrell says. For these patients, RNs, or certified nursing assistants (CNAs) under the supervision of RNs, go bed to bed collecting vital sign and bedside lab data serially on a scheduled and “as-indicated” basis based on patient condition. Among the information gathered are data generated from diverse bedside devices such as glucometers, pulse oximeters, and medical monitors. Each patient is associated with a device or devices. Farrell explains that values are typically presented to CNAs in batches for acceptance or reselection and acceptance prior to updating the EHR database. She says because patient assessment is beyond the scope of practice for CNAs, they do not append characteristics to values or chart other assessment information. Timely charting of patient status, including vital signs, is another element of data quality and best practice in both paper and electronic systems. Farrell says near-real-time charting of key patient assessment data becomes more critical as more physicians, clinicians, and care managers access an EHR remotely to review a patient’s condition and prescribe services. Physicians rely on up-to-date patient data to make safe, effective treatment decisions. EHR and surveillance systems also depend on these data for warnings, alerts, and conditional orders to be triggered at the appropriate time, not after the fact. “The movement to real-time, point-of-care charting has been a culture shock for many nurses and a complex integration effort for CIOs and vendors,” Farrell notes. • poorly authenticated physiologic monitoring device data. • RN “back charting” for long periods as standard practice. Physicians performing CPOE may base decisions on old information when more recent data have been collected but not yet charted. While data charted long after the fact may later appear in the EHR at the time they were collected, the audit trail shows the actual time data were entered, presenting clinical and legal risks. Electronic back charting can mimic late-charting practices with paper processes. • using vital signs as a “data set” as part of a larger RN patient assessment process. “Several technical standards have been established for the transmission of data from medical devices,” says Brian McAlpine, director of strategic products at Capsule, an international vendor-agnostic, legacy enterprise MDI company. These include standards for the formatting of medical device data that are output to systems that collect and manage data. Still, several important features, such as clinician workflow, are not addressed, says McAlpine. “Since many patients with medical devices are cared for in increasingly complex, chaotic environments, many more considerations come into play that all must come together, including patient safety and system reliability and supportability,” he says. • Unit conversion: Devices from different vendors often use different units of measure. For example, temperatures produced in degrees Celsius may require conversion to degrees Fahrenheit. “Standards will reduce the cost and complexity of device integration, but they are in no way the Holy Grail,” McAlpine says. As far as MDI’s role in the meaningful use equation, Farrell says medical device interoperability is currently included in the draft of stage 3 criteria. While MDI is not included in the stage 1 requirements or anticipated to be accelerated to stage 2, the stage 1 core set requirements for CPOE for medications and vital signs (manual data entry) are spotlighting existing vital sign data collection processes and the importance of data quality. “Although not an early requirement for meaningful use, MDI can help healthcare organizations reach other components of the rule more safely and easier. Physicians cannot order certain tests, drugs, or treatments without access to a patient’s latest vital signs data,” McAlpine says. Recently, several HIT vendors performed research to evaluate the quality of vital signs data. In 2009, Intel Corporation and Motion Computing led a formal study on medical surgical units at an academic medical center transitioning to an EHR. Researchers reported “spot check” vital sign error rates of approximately 23% in the paper-based system and with the EHR using manual data entry. Nurses working in the paper system jotted down device data at the bedside and later—sometimes much later—entered it in patients’ charts, creating two opportunities for potential errors to occur. After transitioning to EHRs, nurses memorized data collected at the bedside before entering them into the EHR via a workstation on wheels in the hallway, a common industry workaround. In a separate critical care case study sponsored by iSirona, Wise Regional Health System in Texas reported incidences of 12-hour lag times between when data were generated by devices and validated in the EHR prior to MDI. The industry is experiencing an explosion of device use and increasing EHR data integration in inpatient, ambulatory, and home healthcare settings. Additionally, a growing number of patients are being monitored at home. Data are sent periodically to information systems to be reviewed and acted on by physicians, care providers, and case managers. — Leslie Feldman is a freelance healthcare writer and marketing communications consultant in Philadelphia.